The current social security systems in Europe have not been able to deal with increased traditional and new risks such as unemployment or work-life balance. One suggested solution to this problem has gained more popular and academic support in recent years: the idea of a universal, unconditional basic income (UBI). 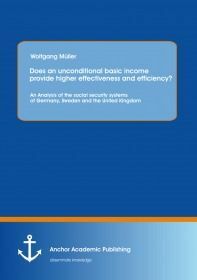 This study, therefore, examines whether and how UBI could support social security systems in the UK, Germany and Sweden in order to achieve their aims and fulfill their functions. Since effectiveness and efficiency describe the functionality of social security systems, the study focuses on these two aspects. These aspects will be used to theoretically discuss expected effects of UBI along with the main aims and functions of key policies in each country in regard to their effectiveness and efficiency. In comparison with current social security schemes in each country, the study demonstrates that UBI is able to deal more effectively with several traditional and new risks, despite problems with higher expectations and living standards. UBI provides basic needs and supports people in need.